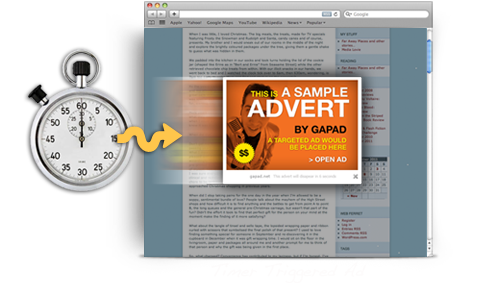 With GapAd timed ads, you can set an ad to trigger after a user has been on your site for a certain length of time. Timed ads make a lot of revenue due to having maximum impact.You can control how often your ads are shown and of course when they trigger. Our technology automatically triggers an ad after a user has been on the site or page for a specified amount of time.